Without its springs your garage door just wouldn't work. These components are the ones that support the door's weight and help it rise and lower as it opens and closes. If they break, the results can be dramatic. They can cause damage to your property, and in the worst case scenario, even injure you or your family if you happen to be inside your garage when that happens. That's why professional handling of these components is absolutely required, and that's why you need to call our team if you need to get them adjusted or replaced. Your garage door will normally use one of two different types of springs. Extension springs are installed on both sides of the door. They stretch as the door closes, and use the stored tension that results from that to contract and raise the door back up when it needs to open. Torsion springs use torque in order to help the door move. They are installed horizontally above the entrance and slowly twist and unwind, in order to pull and lower the door using lift cables that spool around drums. They are more flexible and durable than the extension type units, and therefore, provided that the garage in question has enough headroom space available, they are the preferred choice. Clearly, these components are essential for any garage door to function properly, which is why it's a good idea to have them checked regularly and applied with lubrication that will increase their working efficiency. Our regular spring maintenance service also includes adjustment. The tension of these components must be precise, as otherwise the door could get unbalanced. If during our inspection we notice that these components are in a bad shape and are getting ready to break soon, we'll perform the required spring replacement on the spot. Some people like to do everything themselves. Either out of a sense of pride and achievement or simply to save money. We get that. 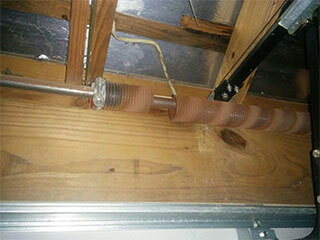 But adjusting or replacing a garage door spring isn't as easy as a lot of people might think. Above all, there are serious risks involved. If one of these components snaps, it can fly through the air with tremendous force, and if you or your loved ones are in the way, the results could be catastrophic. Don't hesitate to contact Garage Door Repair Sacramento today and let our professional team ensure that all your spring-related problems are dealt with safely and quickly.